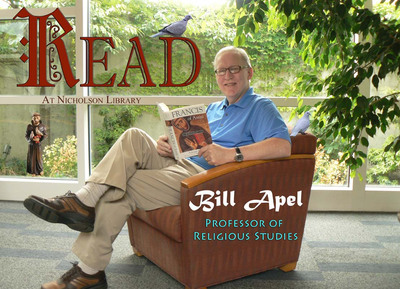 Bill Apel, Professor of Religious Studies, reading Francis of Assisi: A Revolutionary Life, by Adrian House and Karen Armstrong. Terry, Paula and Nicholson Library Staff, "Bill Apel READ Poster" (2010). READ Poster Gallery. Image. Submission 66.